FSPro Preview from Tai Shimizu on Vimeo. Here is something exciting to look forward to in the New Year for iPad using Photographers, Filterstorm Pro is about a month away from beta testing. Developer Tai Shimizu has been kind enough to share a video of the alpha version running on the iPad and it looks lovely with some great features in the pipeline. We have said before how much we like Filterstorm on both iPad and iPhone, it is definitely one of our favourites, so we are really looking forward to getting our hands on Filterstorm Pro. If you are a Photo-Journalist or Photographer and would like to help Tai out, he will be looking for eligible beta testers soon, so drop him a line and let him know you are interested. Filterstorm is one of the first apps we loved when the iPad launched and to this day it remains our favourite heavy-weight photo editing app for iPad. We have mentioned the app more than a few times in previous posts. If you have never tried Filterstorm, we think it is the closest thing to Aperture/Lightroom there is on iOS and we strongly recommend you give it a go now, the app is Universal so you get an iPhone optimised version too. Developer and Photographer Tai Shimizu has been holding off on the most recent update until iOS 4 was released for the iPad, which of course hit iTunes last night, and Filterstorm 2.6 went live on the app store last night too. The update brings with it a re-worked crop tool, which doesn't sound like much but if you saw the previous version the crop tool handles tended to get in the way and obscure the actual photo you were trying to edit, it was the one thing we didn't like very much about the app, especially on the iPhone's smaller screen. The new crop tool takes a different approach to the crop handles and just this improvement alone has made the app so much easier to use. 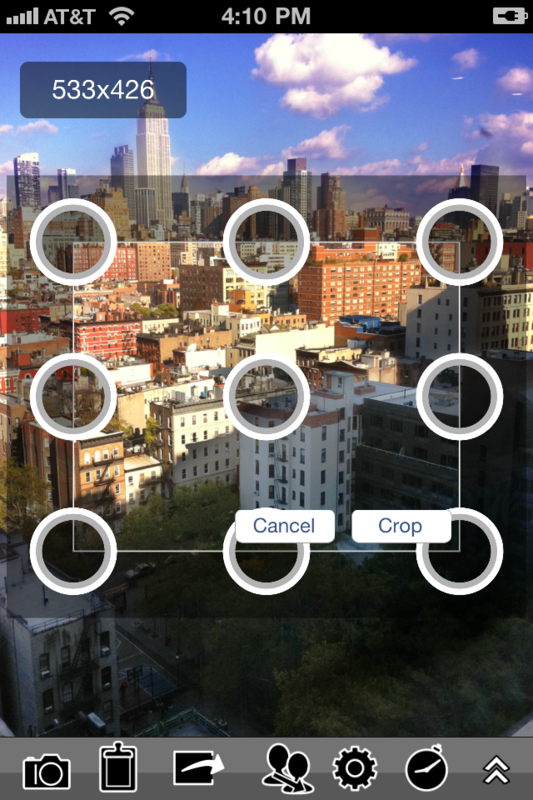 The screenshots below from Tai's blog show the iPhone version of the cropping tool, as you can see it is a nice update. In addition, there are other new features like Borders that can include integrated captioning allowing you to finish the image nicely, new EXIF import from the Photo Library (a big plus when sending the image on from Filterstorm) and a new creative tool in the Multiple Exposure, which impressed us by allowing selective application of the second image by brushing with a mask. Be sure to check out the video below from Tai showing some of the new features and we have included a full list of the updated features below the video. Filterstorm 2.6 is available now in the app store for $3.99 (£2.39). Filterstorm 2.6 iPad Demo from Tai Shimizu on Vimeo. • Pasting photos now supports PNG & TIFF data. • EXIF data can now be read from the photos album and camera. We wrote about the first version of Filterstorm back in April this year when it was originally released by developer and photographer Tai Shimizu. Version 2 is actually a major upgrade that originally started out as Filterstorm 1.5, but as you will see, much has changed, including major UI updates. However, despite all the hard work that has gone into the development of this app, the good news is that this is a free upgrade if you have already purchased Filterstorm. 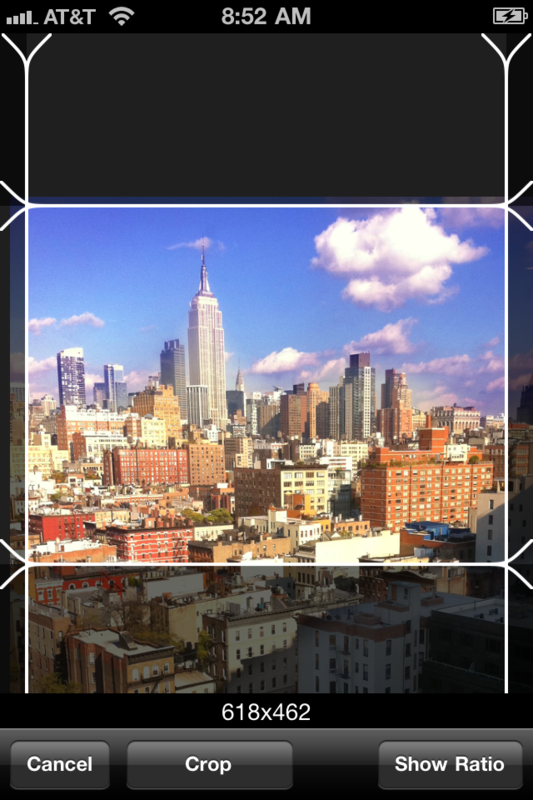 Filterstorm was designed from the ground up to meet your mobile photo editing needs. Filterstorm contains a suite of powerful tools including curves manipulation, color correction abilities, noise reduction, unsharp masking, and black and white conversion fine-tuning. It also includes powerful masking tools, giving you the ability to apply any of the available filters by brush, color range, and gradient, as well as to the entire image. With Version 2 Tai has brought in a new UI that changes the way the app looks considerably. The main controls are now on the left of the screen, rather than in a strip across the top, and they reside in a collapsible pane that can be minimised to just a toolbar with a few icons down the left of the screen. The advantage of this interface change is that previously Filterstorm used drop down or pop out menus which hovered over the image and could obscure the parts you wanted to affect, whereas now the bar can be collapsed whenever you need to see the whole image and whilst making adjustments, much like Aperture and Lightroom do in fullscreen mode on the desktop. If you want to see the whole photo you can also resize it onscreen so that it fits in the space beside the drawer on the left and you will see Tai do this in the video below. Another major addition is support for IPTC fields. These stay with the image on email or FTP export but, due to the limitations that Apple have placed on system access (which we mentioned here), information entered into IPTC fields cannot be saved back to your Photo Library with the original image. Basically, Automations are Macros, and two are included with the app, Enhance and Vintage. This is a really nice addition that allows you to tweak an image or apply some standard adjustments to it and then save that set of adjustments for use on other images. Let's say, for example, you find that you are always applying a certain amount of sharpness, saturation, brightness, etc. on each image from a certain camera, you can save this as a 'preset' like Automation. But Automations can also be used for applying often used text, for example a watermark, as Tai demonstrates in the tutorial video on his site. Filterstorm 2 goes beyond the basic edits which many other photo editing apps offer on the iPad, it is an ambitious app which really pushes the hardware capabilities of the iPad's first incarnation, but it is currently the closest thing we have seen to a 'proper' photo editing app on the platform. Realistically, the iPad as it is at the moment, will not be the platform that you do any heavy photo editing on. But if you are away from your main machine, or just can't be bothered to fire up and wait for your desktop machine, Filterstorm 2 is one of the most comprehensive options for editing photos on the iPad at the moment. Filterstorm 2 is a free upgrade for those who have already bought the app, and for a limited time it is only £1.79 ($2.99). At that price, and with the number of features included, we think it is a definite purchase. Take the time to dive deep into the interface and learn what it can do and we are sure you will be impressed with the results. To find out more and see what Filterstorm 2 is capable of, please watch the video below, and if you try the app out, let us know what you think in the comments below. A few days ago we wrote about the Photo editing apps hitting the iPad store, and one of the apps we were really keen to see in action was Filterstorm. Early indications were that the iPad hardware wasn't quite up to the challenge of editing larger files, e.g. 5MP JPEGs. But developer and photographer Tai Shimuzu has been working hard on improving things and has now got an update in the app store, which he says improves performance, but by downsizing the photo. And it is still free. More interestingly for us, he has posted a video tutorial on the Filterstorm site of him actually editing a photo and completing the process, from selecting the photo in Filterstorm through to the final version. 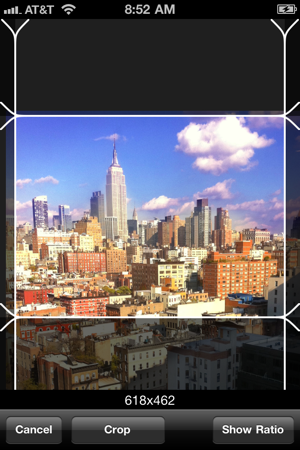 It is really interesting to see the enhancements that Filterstorm can apply to a photo. Watching Tai specify the curve adjustment and then selectively brushing it on to the photo reminds us of the same process in Lightroom or Aperture, and the results are impressive. The app still looks a little bit slow, but until we see it for real, operating on our own photos, we cannot say if that is just because of the video, the app itself or the iPad struggling to keep up. We are sure Tai is continuing to improve the app and optimise it further, but if you are curious to see the iPad in action editing photos for real, check out the video below. In the last few days a number of photo editing apps have gone live in the app store ready for the iPad launch. You are not going to be editing your RAW files yet on the iPad, it doesn't seem to have the processing power for that at the moment, although we would like to see just how slow it is as processing RAW files. But if you have JPEG files in your iPhoto library, or presumably on a camera/SD card although we haven't confirmed this yet, then you can have a go at editing them on your brand spanking new iPad. Here are a couple of notable mentions. The best looking app and the one that got us most excited is Filterstorm. The interface looks really nice and the app is FREE for a limited time after launch day tomorrow, so if you are getting an iPad, go and get it now and let us know what you think. The app takes the approach of having three Image Editing modes: 1) affecting the whole image, 2) brushing on colour and effects to selected areas, or 3) applying filters to a specific colour range. The ability to use an adjustment brush on your photos, much like you can in Aperture or Lightroom, really appeals to us and makes this app stand out from some of the others. Do check out the Filterstorm﻿ site and have a look at the screenshots. The developer, himself an accomplished photographer, is honest about why he is giving the app away for free, basically because there are some features that he has not had time to put in, such as image rotate and cloning/healing tools, and he has not tested how fast it runs on a real iPad! There is a work-through tutorial on the developer's site too, which helps you see in practical terms how useful this app will be. Photogene is an app we have been using on the iPhone for a while, and which now has its own iPad optimised version out in the app store for £3.49. In our opinion the iPhone version of this app is quite powerful but the interface and interaction is not as well refined as some apps. When you get used to the interface for the app though, and discover where all the key tools are hidden, it provides a lot of useful features. Nothing out of the ordinary really, but it is good to see Photogene on the app store and being developed for the iPad platform. Another little heart flutter came upon us when we saw that Nevercenter had announced a version of their wonderful retro-filter app Camera Bag for the iPad. It is a firm favourite of ours on the iPhone, but it has always felt a little cramped at that screen size, so we are salivating over seeing this running at fullscreen on our iPads, and at a special launch price of £1.79, we think it is a bargain. New for the iPad are interface optimisations and increased resolution, but also a new 'Vary' feature, which allows personalisation, maybe a little randomisation, of the filter effect that you have chosen, to give individual results for your images. We can't wait to try it. If you have tried any of these apps on your iPad and can tell us how well they run, or you have used another photo editing app that you think we should be looking at, please let us know in the comments.